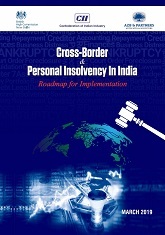 This report identifies and highlights some key infrastructural, institutional and legislative gaps while suggesting the best practices in the realm of cross–border and personal insolvency. The Report is divided into two broad sections: Cross border and Personal Insolvency. The first section covers the current transnational insolvency mechanism in India, and further highlights the prospects of adopting the globally prescribed UNCITRAL model law within the Indian Insolvency environment. The second section reviews the extant laws of Personal Insolvency in India, and in view of the evolving insolvency regime, attempts to identify the key challenges and provide a feasible path for the implementation of Insolvency & Bankruptcy framework for Individuals and Partnership firms.